Everglades fishing during July was great, even with the hot weather and not much rain the fish have been on the bite. The redfishing in The Everglades during July has been excellent! We has been catching good numbers of Redfish early in the morning on the rising tides. Live finger mullet under a popping cork has been working the best for bait. Most of the fish we have been catching have been in the 2-8 lb range. The Snook fishing has also been good in July, most of the Snook we have been catching have been on the falling tides. A lot of the Snook have been of nice size raging anywhere from 7- 12 lbs (typical for Everglades fishing charters this time of year) the bait that have been working the best have been fresh cut ladyfish. In addition, trout fishing has also been good but with the water temperatures hitting close to 90 degrees the bite has been the best early in the morning. The Trout we have been catching have been striking on a Riptide Rootbeer Shrimp tail jig bounced slowly on the bottom in 3-5 ft of water. Over all charter fishing in July was excellent, providing fast and great fishing action. August fishing in Everglades Nat’l Park should be a lot like July fishing pattern with fish being caught early In the morning before the mid day heat sets in. Redfishing has been good all year but in August it should be even better with big schools starting to show up along the beaches and mangrove islands. Redfish are great fighters and provide some great fishing charter action. Snook will also provide some great action in August. A lot of Snook we catch will be mixed in with the Redfish. 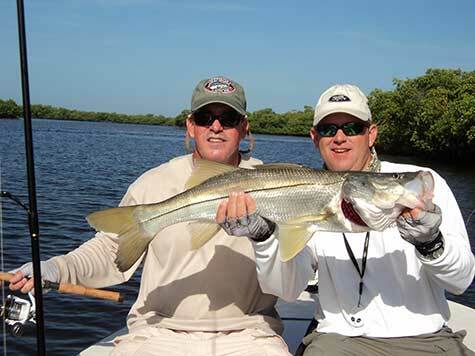 Snook are one of the most popular gamefish here in the Everglades. The fight of a Snook is like no other with head shaking jumps and lighting runs. Catching one will provide you with a memory of a lifetime. Trout fishing will also be good in August with the best fishing coming early in the morning . Trout like to hang around the grass in about 3-5 ft of water were they like to feed on pinfish. Trout can provide so great fast action and also make you a great fish dinner! If you would like to book a trip August or any other month please give me a call.